"The Harmonic Convergence of August 15/16 1987 was an example of how planetary alignments synchronized with much ancient esoteric wisdom, the Mayan Calendar and the Hopi prophecies in particular. At this time there were seven planets in fire signs, symbolizing the purifying as well as the destructive aspects of the times we are entering." Earth Mother Astrology: Llewellyn Publications. Sunrise at Medicine Wheel. Stoney Indian Reserve. life. The mystery of the unknown which has always beckoned us, by the light it contained in its question, will expand us into levels of being and knowing undreamed of by the strife- worn ego of the old mental house. As the index of the rate of planetary acceleration, technology will indeed have trans- formed itself. Through synchronization, this transformation will show us that with all of our bio-electromagnetic hardware and galactic light-body programming, it is we ourselves, Maya returned, who in our own bodies are the best and most sophisticated technology there is—we are the path beyond technology. According to those who investigate telluric forces—Janet and Colin Bord, Lewis Spence, Francis Hitching, John Michell, and others—the Earth has power points that correspond to human acupuncture points, and both can be “needled” to activate energy flow. I am sure this is the reason for mysterious megalithic stone circles and monuments all over the planet. When ceremony, or even simple meditation, is done at sacred sites—such as Mayan temples or megalithic sites in the Aegean or British Isles—it activates or “needles” these power points, and the Earth energy flows in response. This flow can in turn be utilized by people who are ungrounded to resonate with the pulse of the planet by simply being still and meditating at sacred sites. Use of these power spots is one of the ways that indigenous people ground infants. It is also why millions of people went to sacred sites during Harmonic Convergence in 1987. 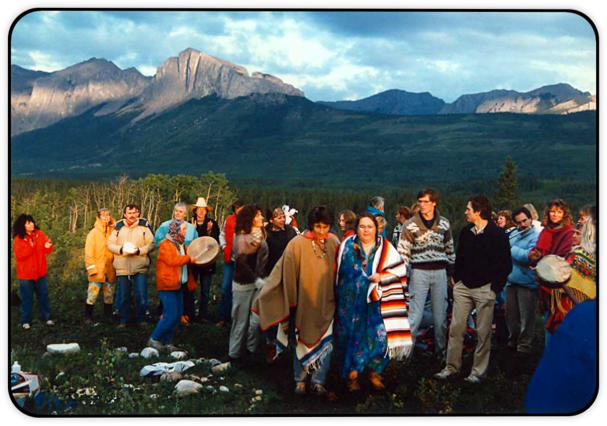 Harmonic Convergence was an Earth-centered ceremonial event simultaneously conducted by self-empowered people all over the planet at sunrise on the morning of August 16, 1987. 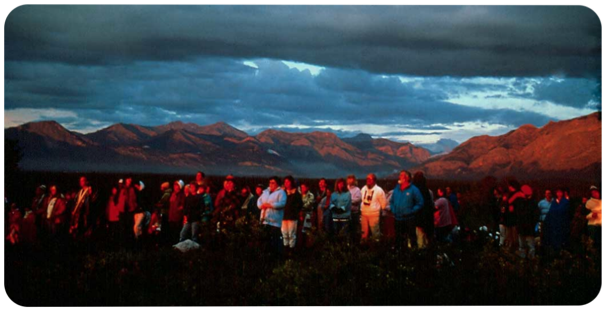 The event unfolded dramatically as a continuous wave of “Earth renewal rites” with representation from every race and from a vast array of spiritual and religious traditions. People performed these rites at sacred sites as diverse as Ayer’s Rock, Mt.Shasta, Jericho Beach, Stonehenge, Teotihuacan, Giza, and Macchu Pichu. United in a single act of spiritual intent and without government support of any kind, this relatively small group of self-empowered individuals created a compelling experience of Earth Community that seeded the mind of humanity with a new collective dream of peace and harmony throughout the planet: The Dream of Harmonic Convergence. The Dream of Harmonic Convergence rests on a foundation of ancient spiritual knowledge that includes, but is not limited to, Mayan cosmology. Independent Mayan researcher Tony Shearer initially determined the date of the event and saw it as an especially profound and prophetic moment in the contemporary manifestation of the Mesoamerican mythological figure of Feathered Serpent, redeeming archetype of universal spiritual liberation. 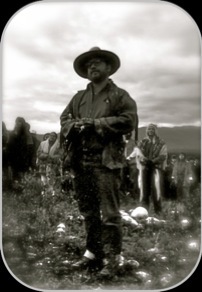 Shearer conveyed the significance of the date to visionary artist and art historian Jose’ Arguelles who consequently found that it aligned with prophecies from a host of spiritual traditions from around the world. According to Arguelles, the Harmonic Convergence event signaled a precise, species-wide entry-point into the final twenty-five years of a 5125-year process of global, cultural evolution mapped by the Mayan Sacred Calendar and ending at Winter Solstice, December 21, 2012. 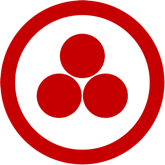 Under the Banner of Peace designed by Nicholas Roerich, he and his wife Lloydine worked ceaselessly for several years to solicit public engagement in manifesting the event and they were profoundly successful. Harmonic Convergence drew together literally hundreds of thousands of people in what was undoubtedly the largest globally synchronized sacred sites ceremonial event of all time. Harmonic Convergence stands as a profound moment of closure to an astronomical cycle closely watched by astrologers to track cultural transformation. I refer specifically, to the cycle of relationship linking Saturn and Uranus which began in May 1942 during the height of the disharmony and chaos of World War II. Harmonic Convergence occurred during the last stages of that cycle when, metaphorically, the seed essence of the cycle formed. It is this seed essence which continues to this day to empower those who are intent on manifesting the Dream of Harmonic Convergence. By tracking the unfoldment of the current Saturn/Uranus cycle which began with a conjunction less than a year after Harmonic Convergence, we are able to view objectively, the ongoing process of manifestion of the Dream of Harmonic Convergence. Elsewhere on this site, I show the results of my own tracking efforts in this regard. 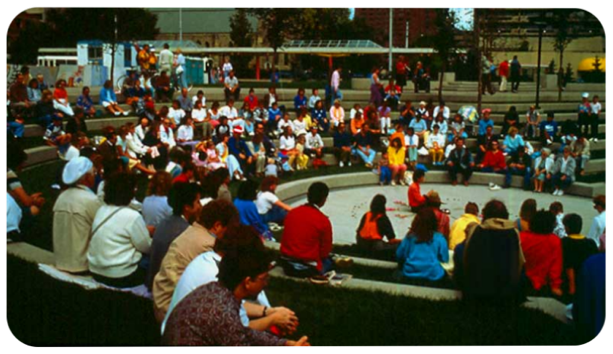 Harmonic Convergence, Aug.16, 1987. Sunrise at Medicine Wheel. Stoney Indian Reserve. 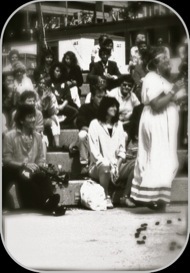 Harmonic Convergence, Aug.16, 1987. High Noon at Olympic Plaza, Calgary. The great return of Harmonic Convergence, then, is like an awakening from cultural trance. It is the opportunity for all to engage the Mayan Factor, and, in a word, to receive the galactic imprint. Though at first we do not appear to be Mayan, by the time we reach the moment for galactic synchronization our way of life shall be in every regard a model- ing after the lifestyle of the Maya who preceded us in Central America. Only we shall find ourselves as planetary Maya, possessing a brilliantly simple and sophisticated technology based on the matching of solar and psychic frequencies which harmonize the "ratio of the sense-fields." Creating a non-polluting technology, we shall allow ourselves to sub- sist comfortably in small bioregional groups, strung together as information nodes on a communications system that has finally dispensed with wires. And lastly, availing our- selves of the leisure time to which our genetic hardware had originally disposed us, we shall collectively come to know as one. In that knowing, our life shall pass into the greater life. The mystery of the unknown which has always beckoned us, by the light it contained in its question, will expand us into levels of being and knowing undreamed of by the strife- worn ego of the old mental house. "Once we understand that we are working with a harmonic matrix, then we can begin to take other symbolic constructs and place them within the ongoing synchronic order -- the time sequences: the four day, the seven-day, the thirteen-day, the twenty-day, the twenty-eight-day, the fifty-two-day, the four quarters, etc. All systems are contained within these cycles." The Dreamspell Count is based on a 28 day Moon cycle whereas The Lightning Path is based on the 29.5 day synodic cycle of the Moon. Each approach has its own unique relation to the traditional Tzolkin matrix. July 26, 1987: WIZARD'S COUNT correlation date used by Jose Arguelles' to (as he puts it) "establish synchronic order as manifestation of the Law of Time in order to transit from 12:60 technosphere to 13:20 noosphere, based on prophetically modified year-bearer count of the Chilam Balam tradition; correlated by the DREAMSPELL to July 26, 1987, White Galactic Wizard." ( Source: Time and the Technosphere).